Modern travellers heavily rely on their mobile phones for business and pleasure. The use of mobile payments and booking and travel apps in conjunction with media consumption, GPS locator and map services, phone calls and emails, can, however, have a drastic impact on the battery life of even the newest devices, leaving mobile users unexpectedly low just before boarding their flight or even worse when in transit. As a result, many travellers started carrying portable battery packs – which are inconveniently heavy and impractical and do also require charging, and various forms of adaptors with multiple connectors for all their different devices and other accessories like headphones, smartwatches, apple pencils, iPads and tablets, e-readers, e-cigarettes, and much more. Many airports have started providing USB charging ports in the form of pole and table charging stations, however, those outlets are rather sparse and most of the times insufficient to satisfy the high user demand. In addition, USB ports are rather fragile when exposed to high usage and still require users to bring their own cable. Recent studies have also demonstrated those public charging station points may be at high risk of ‘juice jacking’, a term coined to describe a cyber-attack where data is stolen from a smartphone, tablet or other computer device connected to a charging port. If a public port is compromised, there's no limit to what information a hacker could take. Charging lockers have also proven inconvenient as they force smartphones owners to leave their devices behind. There have also been many instances where phones have been actually forgotten in the locker by distracted traveller. Like Wi-Fi, Qi wireless charging is now a universal standard available in over 140 devices from major manufacturers including Apple iPhone, Samsung Galaxy, Huawei, LG, Google Pixel, Nokia, Motorola and more (check our compatibility guide to learn which smartphone models offer wireless charging). In addition, smartphone brands have also started integrating the technology into accessories like the latest Galaxy Watch Active and Galaxy Buds from Samsung or the 2nd generation AirPods from Apple. Owners of those devices can simply drop their Qi wireless charging smartphone or another accessory on top of a charging pad to recharge wirelessly, without the need of a cable or adaptor. With such a spread of devices that support cable-free charging, the expansion of publicly available wireless charging points in public venues is imminent, as recently stated by journalist Jamie Carter on the South China Morning Post. Aircharge is the leader in providing wireless charging solution to the transport sector and airports. The Aircharge wireless chargers are manufactured utilising the highest grading infrastructure components for contract use and can be integrated into any table top for a seamless finish and premium experience. With a surface or sub-surface integration, the Aircharge wireless charging pads can be easily installed in food courts, passenger terminals, bars, restaurants and at gates, providing an invaluable service to all passengers. The Aircharge wireless charging units are water and dust-proof, and with additional features including thermal heating sensor, foreign object detection and internet security, provide the safest and most convenient charging experience in the airport. With the addition of the latest IoT technology, airport facility managers can monitor the health of the wireless charging network, deliver over-the-air firmware updates, analyse user patterns and receive exception reports for automatic maintenance calls. The Aircharge wireless charging units can be co-branded by an airport partner brand for increase awareness and brand engagement. With the addition of QR code landing pages and mobile notification, airports, airlines and their partners can communicate directly with their customers at Point of Charge and interact with them via promotional offers, loyalty programs, etc. 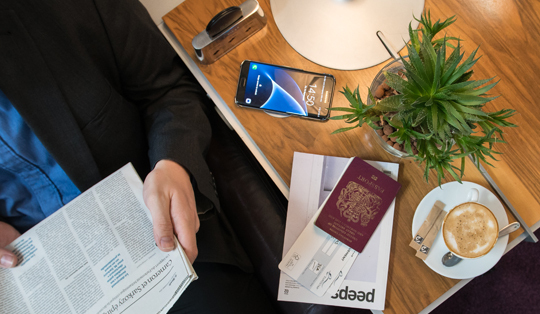 Aircharge works with leading furniture manufactures in the transport and airport industry including Vitra, Baker-Bellfield and OMK to create beautiful designs integrating the latest wireless charging technologies. To learn more about Aircharge wireless charging for airports and the transport sector click here or contact us directly.